2018, a full year of forest school in Singapore. A total of 40 weeks of regular sessions, and 12 weeks of holiday camps, coupled with 20 over workshops plus another 20 over projects, were conducted over the course of the year. It may seem calm on the outside, but 2018 was a tumultuous year for Forest School Singapore internally. Our philosophy was on the basis of sincerity, honesty and vulnerability. Those values are hard to maintain in the midst of sustaining Forest School, while maintaining the standards and integrity of Forest School in Singapore. The personnel (Coaches, Volunteers, Parents, Sister Community Leaders) who have seen us through 2018, are one of the most amazing, committed and passionate individuals that Singapore could have. No, we do not chase after riches and fame, but we are strict in trying to maintain the spirit of Forest School. And that took a toil on the team and community in 2018. In January 2018, we lost a key coach/manager, due to our inability to provide sustainability for the team. A group of new coaches took over the scene in the Forest School sessions and camps. During the first few months, there was a lack of leadership, foundation and timeliness in how forest school was operating. There was plenty of conflict and disagreement throughout the first 6 months of 2018. Those difficult internal times, stretched the team performance but also filtered and built a collective consciousness amongst the community and team. These issues arose largely, due to the desire to expand forest school, too quickly within a short period of time. In addition, the expansion was done in a business and old-school structural way, that really deviated from the core values and spirit of Forest School. It was so draining, that we even had a day in June, when 4 programs (Forest School, Holiday Camps, Projects, Family walk) were all occurring on the same day. And it terribly stretched the Forest School Team to its limit. All that changed in July 2018. During the month, we were on the verge of expanding the program, by employing 4 full-time staff, for a total operation value of SGD12,000 per month. The arrangement would have required loans from the banks, and an increase in enrolment so taxing that, we would have turned into an organisation like everyone else, chasing numbers and meeting the bottom line. It would have driven Forest School Singapore to collapse in less than a year. But the contracts were retracted at the very last minute. A sign was shown to us, on the night before the contracts were signed. Like a mystical moment, the trees spoke, through the winds of the evening night. Darren, our Principal Coach, saw the amount of strain on the team and the environment had Forest School expanded so haphazardly, following the same business economic model that have driven our world into the unequal and selfish state that we are, on a corporate level. The decision was made to keep Forest School Singapore small and mobile, without any further full-time staff. The decision will also reduce the pressure to increase the enrolment to meet the total cost of running the forest school, and also sustain the salaries of the personnel involved. It also allows the program to be running at a reasonable cost that could allow the long term continuation and sustainability of Forest School Singapore. In the process, some individuals were disappointed by the multitude of changes. However, Forest School Singapore continues to expand locally and regionally, through the most organic and natural form of sharing and support. We supported the introduction of various new set ups of Forest School in and around Singapore. We also supported other sister communities in their programmes. It did not yield monetary return like franchises, or profit sharing collaboration. But it yielded something more valuable – relationship, love, bond and friendship. Between September to November, Forest School Singapore experienced a roller coaster of a ride. We found out that the Rifle Range Forest that we called home for the past 3 years was going to be closed for renovation by the National Parks Board agency nearing the end of the year, to provide coverage from further urban development. We had to look for a new home in a short period of one month, and move our whole “campus” to another location. But the story of losing our home didn’t stop there, we wrote an article, and made a stand for our beautiful home (Rifle Range Forest), as she had protected us and allowed us to be there for so long. It is only right that we stood for her in the face of uncertain changes. The courage and passion shown in the issue, caught the eye of TODAYonline journalist who covered our story together with a coverage on Forest School Singapore pedagogy within the education and nature landscape. The news coverage drew plenty of attention, and kicked up a little debate between conservationists and educationists. It was quite an intense period for us in Forest School Singapore, in terms of popularity and also having the will to withstand the criticism and attacks from certain communities and individuals. (Not like we haven’t had them last year anyway, hahaha) People are always going to talk and blabber away, but we only believe in those who take action and come forth to engage with us, instead of being just an empty container. In September, we were invited to Kuala Lumpur, Malaysia to give a short introduction talk to an audience group regarding Forest School. It was our first time, holding a sharing session outside of Singapore. 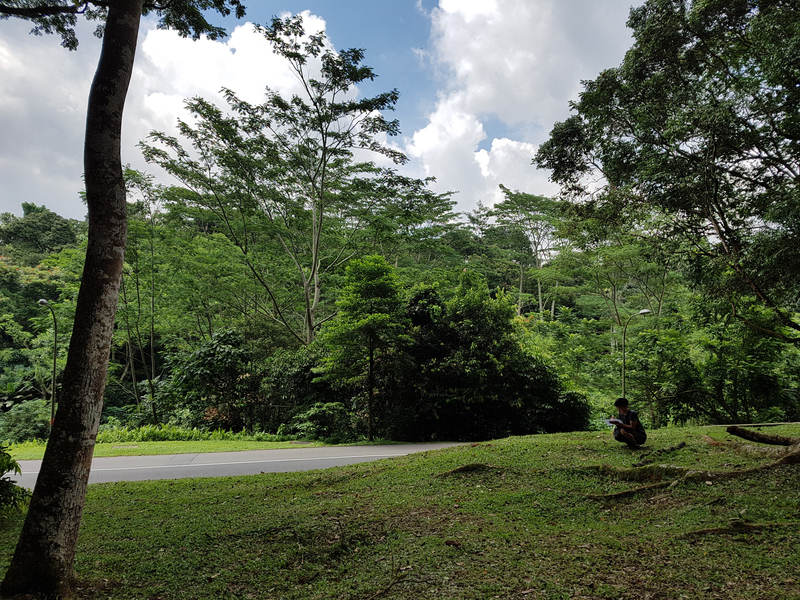 In October, we officially moved to Bukit Timah Nature Reserve as our temporary Primary base, before planning to move back to Rifle Range Nature Park in 2020, when the renovation is completed. In the same month, Coach Darren travelled to Medan, Indonesia to conduct our first Forest School session with our Partner School, Forest School Medan. In November and December, we experienced full attendance for the Holiday Camps, which stretched the manpower of our team, due to some issue in the manpower department, which resulted in the replacement of our manpower manager. Rebecca Ko, our Senior Coach and ex-2IC came back to helm the manpower manager role. We manage to tide over the Holiday Camp with just enough manpower. But also, we realise what we need to do to prepare for 2019 in terms of our coaches and volunteers. Lessons were learnt. In December 2018, we also did our first 3-day forest school dimension training for our Malaysian counterpart in KL. It was an eye opener for both participants and teacher. As we come to a close for 2018, we must say, it has been quite a ride this year internally. Though on the outside we are doing really well, in terms of exposure and sustainability, we did struggle internally and had plenty of quarrels and conflicts which many don’t see. But all these only serve to make us stronger as a group, as a community. I guess, the more we experience, the more we get better at dealing with the external and internal issues. This year was largely internal. We are glad we went through this journey, to come to where we are. We appreciate all the coaches, ex-coaches, volunteers, ex-volunteers who quietly helped and supported Forest School Singapore throughout these times. You will always be remembered (Check our facebook album to see why). Forest School has a mystical connection for me, it is special that way. What makes Forest School special to you?